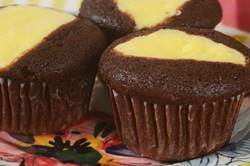 Black Bottom Cupcakes are a delicious combination of a rich chocolate cake and a creamy cheesecake. They would be suitable for any occasion, from a formal affair to a breakfast treat. This recipe will give you twelve generously sized cupcakes and for easy removal, always line the muffin cups with paper liners. There at two parts to making these Black Bottom Cupcakes. First, the cheesecake filling which is simply a beaten mixture of full fat cream cheese, white sugar, an egg, and a little vanilla extract. Beat the mixture just until creamy and smooth. If you decide to mix the filling in a food processor, rather than with a mixer, do not over process or the filling with be too thin and will dissolve into the chocolate batter as it bakes. The second part is the chocolate cake which is a unique recipe. I say that because this cake does not contain eggs, butter, or milk. It often goes by the name Wacky Cake (no one knows why) and it was probably invented during World War II when there was rationing of butter, milk, and eggs. What is amazing is how good this chocolate cake tastes. It is moist and spongy with a nice chocolate flavor which comes from cocoa powder, not melted chocolate. This chocolate cake is also very easy to make, as no mixer is needed. The dry ingredients are simply placed in one bowl and the wet ingredients in another bowl. The two are mixed together and you are done. Once the two batters are made, the first thing to do is to pour the chocolate batter into the muffin cups. Then a couple of tablespoons of the cheesecake filling is placed into the center of the chocolate batter. If you like you can sprinkle some miniature chocolate chips on top of the cheesecake filling. The cupcakes are then placed in a moderate oven and as the cupcakes bake the chocolate batter becomes like a shell for the cheesecake filling. You can eat these delicious cupcakes hot, cold, or at room temperature. If there are any leftovers they can be stored in the refrigerator for a few days. Black Bottom Cupcakes: Preheat oven to 350 degrees F (177 degrees C) and line 12 muffin cups with paper liners. Cream Cheese Filling: In your electric mixer, or with a hand mixer, beat the cream cheese until smooth. Add the sugar, egg, and vanilla extract and beat until creamy and smooth. Set aside while you make the Chocolate Cupcake batter. Chocolate Cupcakes: In a large bowl sift together the flour, sugar, cocoa powder, baking soda, and salt. In a separate bowl mix the water, oil, vinegar, and vanilla extract. Make a well in the center of the dry ingredients and stir in the wet ingredients until nice and smooth. Evenly divide the batter among the 12 muffin cups. Then spoon a few tablespoons of the cream cheese filling into the center of each cupcake. Bake in the preheated oven for about 25 minutes, or until the cream cheese filling has set and the cupcakes feel springy to the touch (a toothpick inserted into the chocolate part of the cupcake will come out clean). Remove from oven and place on a wire rack to cool. The cupcakes can be covered and stored in the refrigerator for about 3 - 4 days.